ORLANDO, FL -- (MARKET WIRE) -- November 28, 2005 -- Quantum3D®, Inc., a leading provider of COTS, open-architecture, realtime visual computing solutions for the Visual and Sensor Simulation Training (VSST) and Embedded Visual Computing (EVC) markets announced today at the Interservice/Industry Training, Simulation and Education Conference (I/ITSEC) that the University of Florida has selected Quantum3D to develop a highly-detailed geospecific synthetic environment GeoScapeSE™ terrain database for use in an advanced UAV research project for the USAF. The GeoScapeSE McKenna Mobile Operations in Urban Terrain (MOUT) Export Restricted (ER) Terrain Database, along with other GeoScapeSE Databases will be on display at I/ITSEC in the Quantum3D Booth No. 1873. The GeoScapeSE McKenna MOUT ER Terrain Database will be used for a USAF-funded research project to develop agile, autonomous, unmanned micro air vehicles for urban operations and as a foundation of the University's Department of Mechanical and Aerospace Engineering Hardware-in-the-Loop Simulation (HILS) Facility's R&D efforts related to vision-based UAV controls. "The University of Florida studies should prove very important for advanced UAV research," said Ross Q. Smith, Quantum3D president and co founder. "UAVs are becoming increasingly important in surveillance, intelligence and even precision strike applications for urban warfare operations. The University's selection of Quantum3D to provide critical terrain database technology for this important program speaks to the skills of our synthetic environment team in Orlando and the high fidelity of our offerings." The GeoScapeSE McKenna MOUT ER Terrain Database is a highly detailed geospecific representation of the McKenna MOUT site at Fort Benning, Georgia, and the surrounding area. 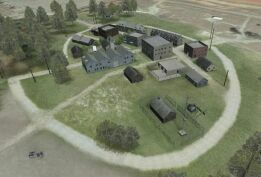 The MOUT site virtual buildings are textured using photos from the actual buildings and the building interiors are fully modeled to allow flight into and through the buildings. To provide accurate cueing at altitudes down to ground level, the database includes 1-texel-per-10cm2 detailed texture applied to the terrain within the MOUT site and 1-texel-per-1m2 geospecific imagery for the surrounding area. Quantum3D develops and markets realtime, open-architecture COTS IG solutions, embedded visual computing systems and subsystems, development software and support services for the VSST and EVC markets and is the exclusive supplier of NVIDIA® graphics technology for the embedded military and aerospace visual computing market. Quantum3D is a privately held company headquartered in San Jose, California, with development centers located in Phoenix, AZ, Huntsville, AL, and Orlando, FL. For more information about Quantum3D and the Quantum3D family of open architecture visual computing solutions, please see www.quantum3d.com. Quantum3D is a registered trademark and GeoScapeSE is a trademark of Quantum3D, Inc. All other trademarks are the property of their respective owners. The GeoScapeSE McKenna MOUT ER Terrain Database contains information that may be subject to U.S. export restrictions. Contact Quantum3D for more details.